Jardin Neslon boasts cool jazz, beautiful flowers, but you can't eat ambiance. Jardin Nelson. Multiple Dishes. Photo Esther Szeben. Old Montreal is bursting with restaurants that I want to visit. But being tucked away at the base of the city, it takes some planning to make that kind of commitment and head in that direction. Fortunately, I had an excellent excuse as we were heading to see the Cirque’s new show, Kurios with friends and added dinner to the evening’s activities. Jardin Nelson Interior Facade. Photo Esther Szeben. I first heard about Jardin Nelson over a decade ago when friends came to visit us from Ontario. 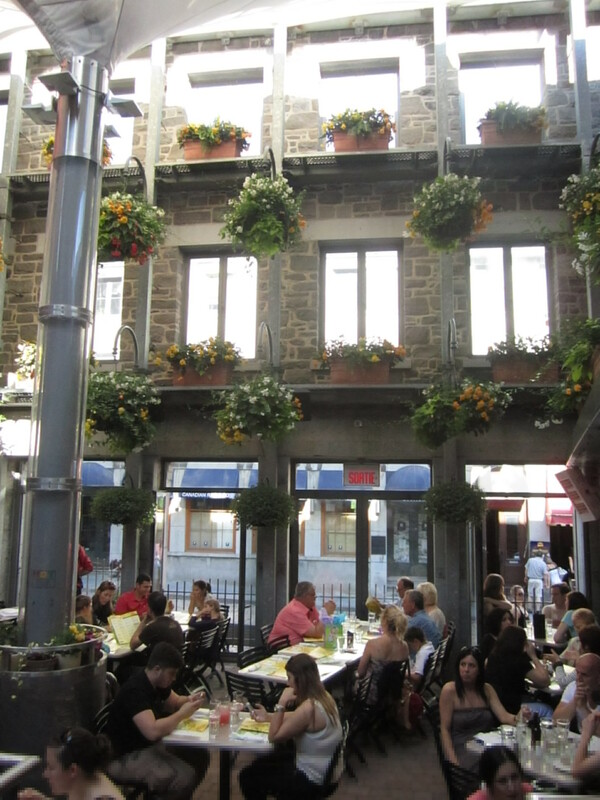 We met up with them for dinner and they recounted a tale of their wonderful lunch at this fabulous Old Montreal terrace. They likened falling upon it to that scene in The Beach when Leo DiCaprio emerges from the cave to find the quintessential beach, water fall paradise. Instinctively I assumed it was a pro-tourist-venue where locals wouldn’t really set foot. Recently, it became a preoccupation of mine to investigate this particular resto since informally polling fellow Montrealers. An overwhelming majority of people named this as a Montreal must, and one that is family friendly on the pocket as well as in terms of menu and ambience. Be warned: they do not take evening reservations. On a Saturday night, with an 8 p.m. show on our clock, we figured we’ll take a chance and aim for 5:30 p.m.. A small line up in front of the Place Jacques Cartier restaurant indicated that we may have a short wait. The Maître d’ had a detailed method of triaging guests: we had a choice to sit on the terrace facing the bustling activity of the square, sit inside the restaurant, or sit in the garden. Opting for the garden, we were escorted to a second line towards the alley-way leading to the back yard. We cautiously told the hostess that we were a party of eight, but that if dividing into two tables of 4 would seat us sooner we, would be amenable to that option. As luck would have it, we were seated immediately all-together in the house’s best seats, just below the historic North wall façade with optimal view of the stage and the numerous split- levels of terraces! Jardin Nelson used to be a part of the heritage building the Hotel Nelson, an old grey stone building. The restaurant kept the exterior façade of the North facing wall, with its bright open windows. 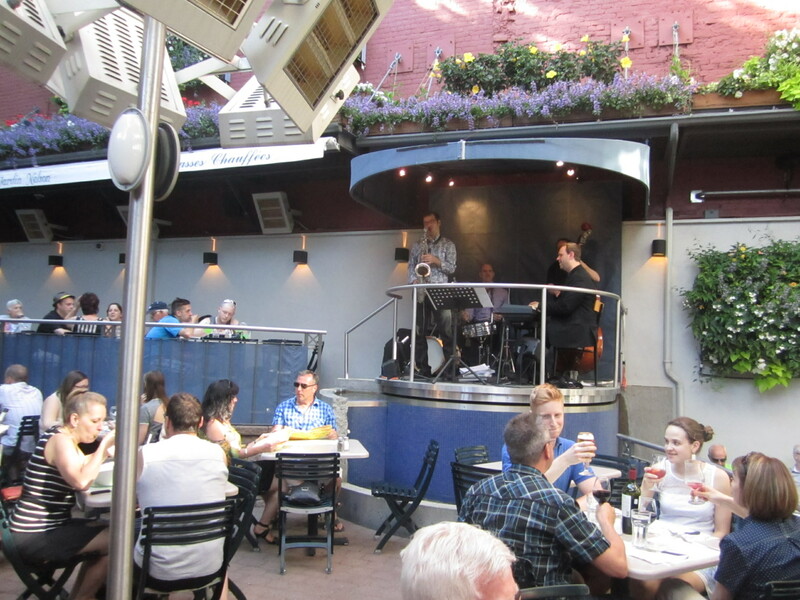 There are multiple split-level terraces with one raised stage where a jazz quartet plays nightly. Our waiter explained that the restaurant is seasonally open between April and October The flowers were added on May 15 which took an entire frenetic day to assemble, but they truly make a memorable meal for the ambiance it adds. Little purple lobelia line boxes along awnings while yellow begonias are the principle flowers cascading from arrangements. Industrially large umbrellas are strategically positioned throughout the terrace should the weather turn less ideal, they can open and probably cover most of the tables. The menu is extensive with three pages devoted to cocktails and varieties of ciders and sangria (at the cost of approximately ¾ of the price of a meal!) and several pages dedicated to crepes, pizzas, salads and sandwiches. I got the sense that the menu caters to the following: crepes for the tourists seeking “authentic French fare” (they use organic flour in the batter of all their crepes, with the exception of hemp flour) and cannelloni/ lasagna style comfort foods to satisfy the client with a heartier, and more familiar, perhaps, less adventurous craving. Crepe Forestière. Jardin Nelson. Photo Esther Szeben. You won’t find too many original dishes. The most exotic item ordered of the eight dishes we sampled that night, was a side salad that accompanied the Crepe Forestière composed of daikon, dried cranberries in a sesame vinaigrette. 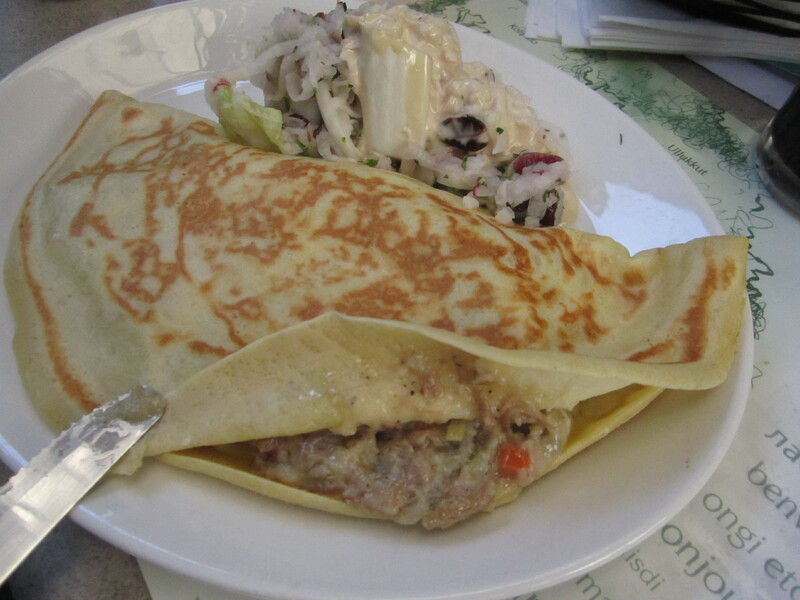 This stuffed crepe contained an assortment of mushrooms, sautéed veal with brie in a creamy sauce and its taste and texture was reminiscent of chicken-pot pie. The Crepe Nelson was not an ideal evening crepe but would make a perfect brunch order with its sweet batter base, homemade sweet apple stuffing, cinnamon, bacon, mozzarella, cheddar cheese and maple syrup. American Pizza. Jardin Nelson. Photo Esther Szeben. 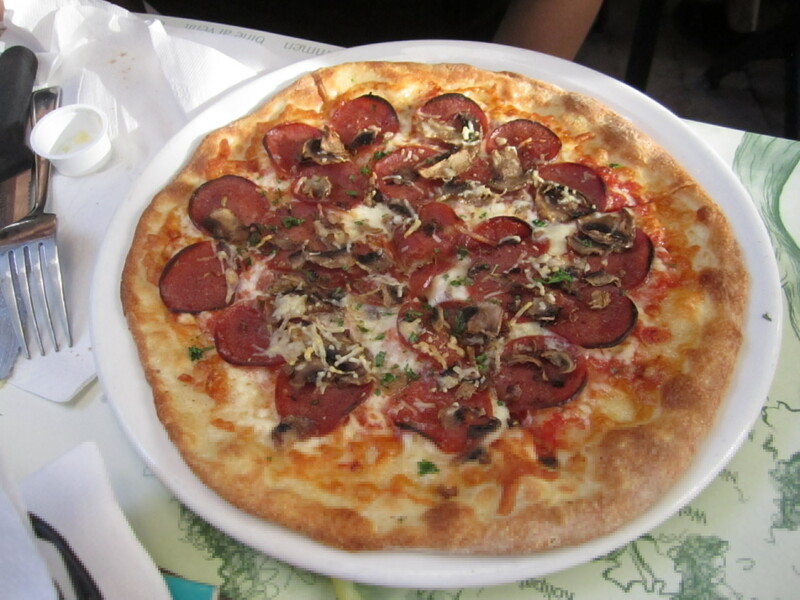 Staple fare in their version of the Americano pizza: a thin crust topped with tomato, pepperoni, sweet peppers, mushrooms, cheddar, mozzarella and parmesan cheeses. 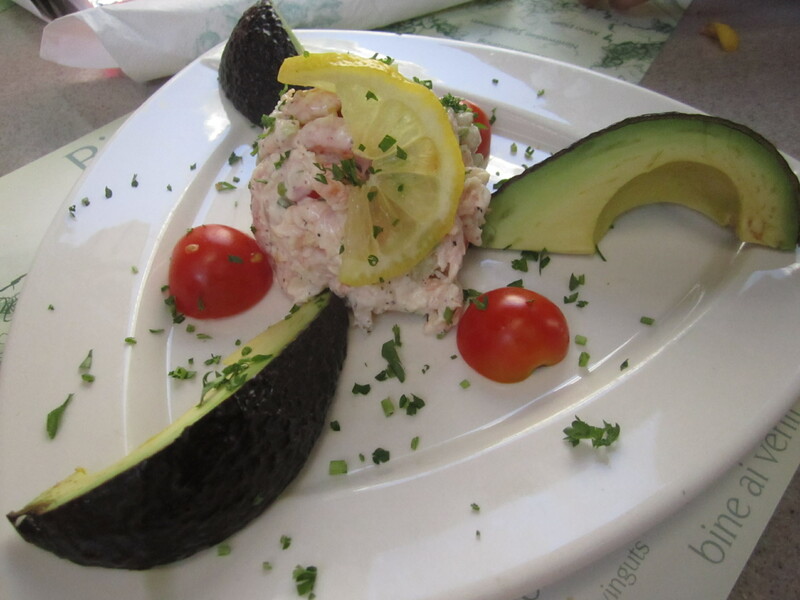 Avocado and Nordic Shrimp Salad. Jardin Nelson. Photo Esther Szeben. UnBeetable Salad made an excellent dinner choice for the hot day we were experiencing. Arranged in an elegant unsymmetrical bowl, a roasted beets duo, parmesan shavings, pine nuts , fried onions, citrus, fresh berries, endives with a balsamic raspberry dressing over mixed greens was a medley of flavours. For $16.95 a few token slices of grilled chicken breast or shrimp would have made the plate a little more substantial. 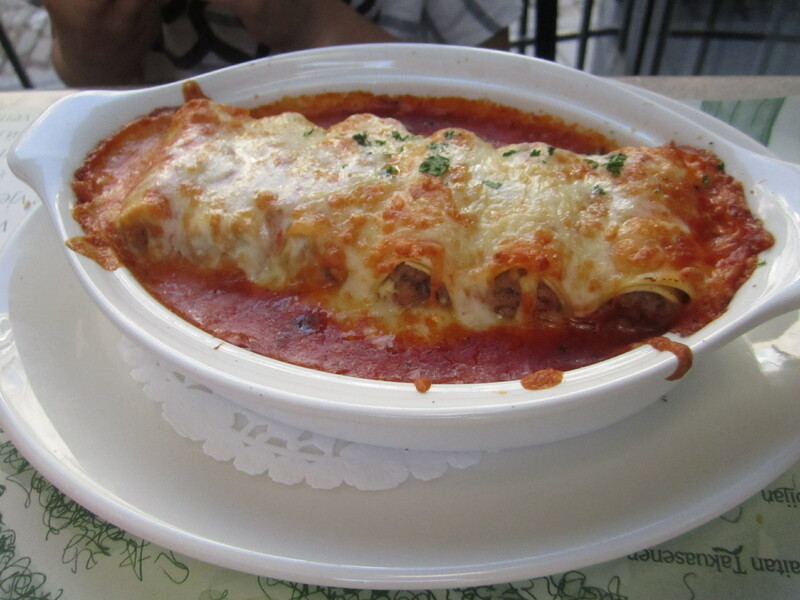 Baked Canneloni. Jardin Nelson. Photo Esther Szeben. The service was excellent. For a full house, we were served with drinks within 10 minutes of being seated and 30 minutes for our meal. Our server tried to pry my daughters nearly empty glass from her hand, then realized there was still a maraschino cherry nestled beneath the half melted ice. He returned with a plate with enough cherries for all the kids at the table! The food is tasty and good. The dishes don’t leave you with that desire to chew extra slowly to savour every bite, but you leave satiated. I would definitely return to take visitors here for brunch. It’s a nice pit-stop while touring the old city. I wouldn’t go back on my own because it falls in to that novelty category and there wasn’t anything on the menu that I can’t get anywhere else. So where was I dining in Old Montreal when I should have been experiencing Jardin Nelson in the past? As I mentioned, I rarely make it to that part of town. I can count on going there every two years, usually in the spring before going to the new Cirque du Soleil show. In the past, I ate at a variety of different restaurants in nearby Chinatown. Asian food is probably my favourite genre of cuisine. 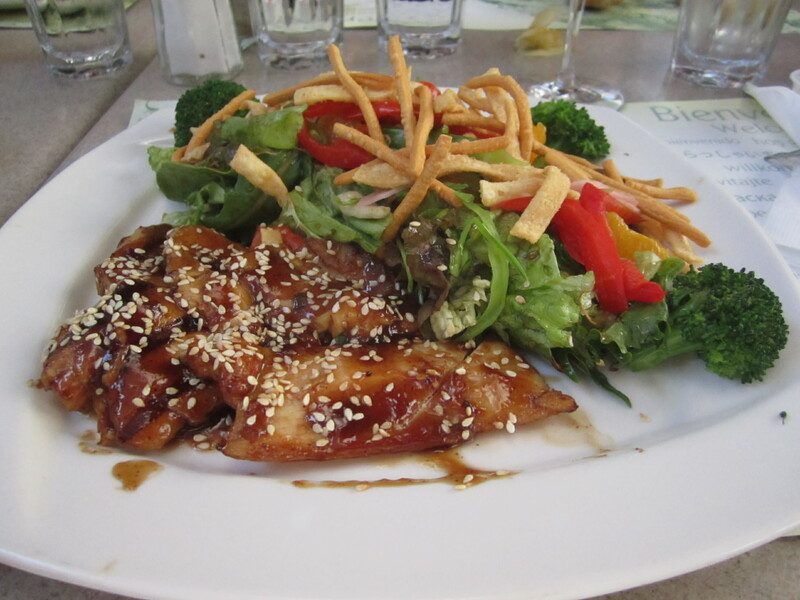 Funny enough, the dish I ordered that night at the Nelson was Asian Salad with chicken! Mixed lettuce, bean sprouts, mandarin snow peas red pepper Chinese noodles, preserved ginger in a sesame dressing. I would much rather have had Szechuan beef on rice noodles with some General Tso’s Chicken and sticky rice! 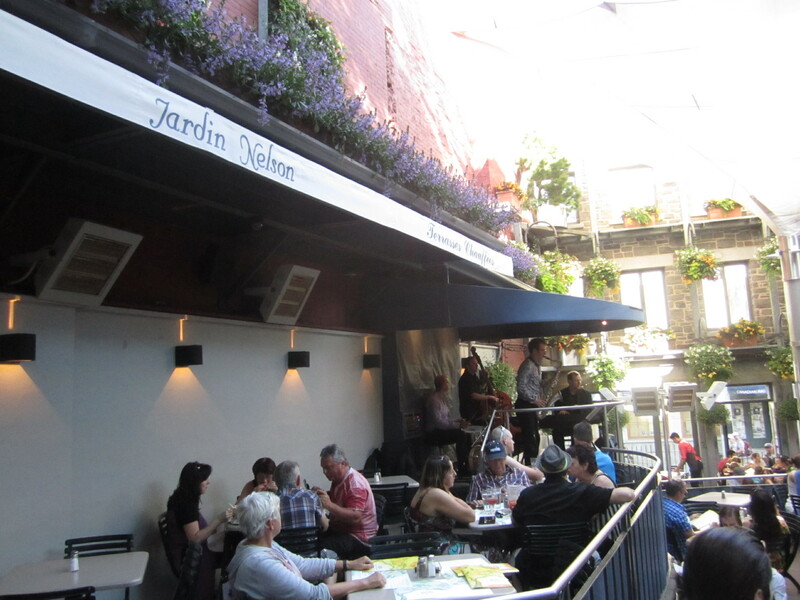 Jardin Nelson is located at 407 Place Jacques Cartier. Opening 11:30 a.m. weekdays, 10:00 a.m. weekends. Closing hours vary between 22 p.m. and 1 a.m.